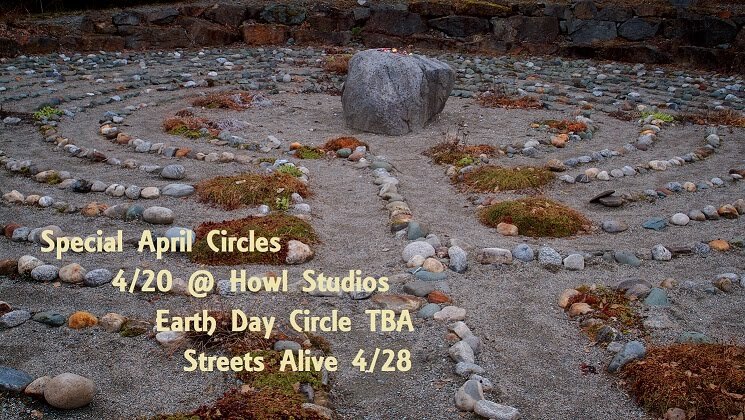 Change of plans- No circles @ Howl Studio on 4/20 nor Earth Day @ GreenStar. It's time for our family to come home and celebrate the 23rd year of our circle. We'll drum and share a meal together with our One Heart sisters, brothers, papas and mamas. Everyone always has a place in our heart. It's also a time to remember our founder, Steve Calkins. For those of you that didn't meet him before his death in 2011, know that if you've ever felt a beautiful welcoming energy at the circle, many of us feel it's him. We strive to keep his vision going that anyone may come to the circle, no matter their abilities and that they feel like a part of One Heart Community Drumming. We'll be serving pizza-vegan, vegetarian and conventional options. Desserts, beverages, snacks or anything your heart desires would be appreciated but not mandatory. We start at 3:00 and go as long as the energy keeps us. These are always magical circles so come eat, drum and be merry. Foundation of Light. It's 2 doors south of the main building. Its time for the One Heart family to come home and join together to give thanks for the love we share for one another. We are often on each others minds but always in one another's hearts. This is an occasion for time to pause and us to connect and drum and share a meal together. We're continuing with our new tradition of serving pizza- vegan, vegetarian and conventional options will be available. It would be much appreciated, but not mandatory, for you to bring desserts, beverages, snacks or anything else your heart desires. We do ask that it be easy to serve to keep the cleanup to a minimum so there's more time for merrymaking. Come love and be loved as we keep on keepin' on One Hearters. Friday is the 3rd one of the month which means we'll be in the haven of Sacred Root from 4-6:00. Since Cayuga Sound is happening this weekend at Stewart Park, Saturday we'll be moving into town to Thompson/Triangle/Bell Park on Cayuga. We'll also be there an hour earlier than usual since the cooler temps have arrived. Then on Sunday we'll slip into Thompson Park again for PorchFest. We're not officially on the schedule due to a mix up on our part, but there's an opening at 4-5:00 and we may possibly be able to start at 3:00 so get there to set up n set our souls free. It's basically the same as we've done in the past as we've never been on the schedule. The circles at PorchFest are great as the park is filled with amazing energy from all the people wondering about ready to be filled with rhythms of the day. It's that freaky, eclectic, celebration of our place in the universe time once again. It's bittersweet that we won't be in the #2 spot this year as the organizer informed us that " We invited the Chief of the Cayuga Nation to share the lead with Mayor Myrick, and the Chief wanted to have members of his tribe performing traditional dancing immediately behind him. So - I needed to keep some distance between his drummers and yours." But if we can't be in front what an amazing group to be #2. We're not too far back at the #8 spot right in front of our friends from the Ellis Hollow Preschool. If you don't want to carry a drum, bring shakers, tambourines etc or nothing at all and walk, dance, hoop or anything your lil' heart desires. If you want to 'dress up' do it- if you don't want to- don't. For those of you that don't want to walk the whole route you can step in anywhere along the way but the sooner you join in the revelry the better. The parade starts after the Festival Mile runners go through which is about 6:30 so be there at 6:00 and no later than 6:15 or so. Our staging spot is on Lewis St near the corner of Cayuga St. The Tabernacle Baptists will again open their bathroom facilities for all, and will serve FREE hotdogs, lemonade and cookies. Please enjoy the food and thank them for this generosity. It's not mandatory to purchase a $5 festival button but the organizers encourage it. We'll gather at the park to drum and discuss the upcoming Ithaca Festival Parade and Saturday Circle that weekend. Due to Springs refusal to be sprung we'll be at FOL Sunday the 29th 2-4:00 instead of Streets Alive. Join us for drumming at two community events. First, on the 22nd we'll be closing the Earth Day Celebration hosted by Sustainable Tompkins at The Space at GreenStar starting at 5:00. You might want to arrive early to enjoy the exhibits, music and art by locals and then be there for the start of the circle. Second, we'll be at Thompson/Triangle/Bell Park on the 29th for Streets Alive. This is always a great time while getting a rare chance to drum in town. We'll start gathering around 1:00 so c'mon and share some love peoples. Times can change at Sacred Root due to performances following us on the same night. If the weather is ever above 60 on a Saturday we'll try for Stewart Park. Same goes for the 15th scheduled for FOL. The Earth Day Circle is at 'The Space at GreenStar'. Lots of opportunities for drumming this transitional month- check FB for updates and reminders. Sunday March 11th we'll be at FOL's red schoolhouse 2-4:00 instead of the main building. Join us as we celebrate One Heart's 22nd Anniversary by sharing a meal, drumming and camaraderie, marking the continuation of our Steve's vision. We will once again dine on pizza since it has done so well the in the past. We'll have vegan, vegetarian and conventional options. It's not mandatory to bring a dish although, drinks, snacks or anything else your heart desires is welcomed, but please make it a 'finger food' so we spend our time drumming and not cleaning up ;) Donations are never required but are always appreciated. Come love and be loved One Hearters. Due to a scheduling conflict we will hold our circle at The Little Red Schoolhouse located south of Foundation of Light. If the parking lot is full you can park at FOL and walk over. Many members love this sweet little spot so come check it out. Our circles have 2 locations this winter. On the 1st, 3rd & 5th Fridays of the month we'll be at Sacred Root 4-6:00 and on the 2nd & 4th Sundays we'll be at Foundation of Light 2-4:00. This gives us circles basically once a week and, hopefully, everyone an opportunity to join us. Please remember there's no smoking near the building or in the parking lot at FOL. These celebrations are our version of family reunions. A time for many of us that can't make it to regular weekly circles to come together and reunite with members and share our love for one another. The years go by so quickly and it's nice to have this time to know you always have a place that you are loved, accepted and appreciated for being who you are, a One Hearter. And always a time to remember our Steve. For those of you that think you haven't met him, you have. Every time you're at the circle and you feel positive energy, it's him. Since it has gone so well the past few times at our celebrations we will, once again, be feasting on pizza. It seems that it appeals to more of us as well as freeing up more time for drumming and not clean up. We will have conventional and vegan options. If anyone has any other needs let us know and we will accommodate as best we can. Bringing desserts, drinks or anything else your heart desires would be very much appreciated so if you can, please do. Be a part of the opening ceremony at "V the Change"
We have been invited to drum at this celebration by our dear friend Kelli Jean. This is from the event page on Facebook. A time to honor those people or pets that have passed on... bring a picture or symbol for the alter and a favorite food of the dead. drumming, Ancestral meditation, chanting, followed by potluck & celebration music by Cozmic Theo and friends.. If you're not into the ritual aspect just come and drum or for the potluck and music afterward. We'll have our regular Saturday Circle at Stewart Park at 3:00 and afterwards head on over to Howlfest. There will be time to partake of the festivities before the drumming gets going around the bonfire. This is going to be amazing so don't miss it. Howlfest, hosted by Papamuse, Vee Da Bee, and Howl Studios, has invited us to drum at the festival at Howl Studios,1607a Trumansburg Rd on OCT 14. From their FB page-"A showcase of Howl Studio musicians and artists and a celebration of the fall harvest and sustainability. This block party to include Regional Access, Stick and Stone Farm, Renovus Solar, Indian Creek Farm and the Namaste Montessori School, local businesses that share our neck of the woods and a desire to better the world. We will have great musical performers, a fire and hand drumming, an art gallery, a late night DJ and food provided by The Piggery and others tba." For those of you that remember Musefest and the music, dancing & drumming around the fire, you know what an amazing time this will be and for those of you that never experienced it, your time has come. They need someone to tend the fire that will be going all day and when the drumming really gets going at 10:00. So if you fancy yourself a Brigit or Grannus let us know via email or facebook. If you can't do the whole day you can volunteer a certain time. Saturday, the 23rd, we'll be at THOMPSON/BELL PARK at 3:00 due to the Cayuga Sound Festival happening in Stewart Park. We will then return back to Thompson Park Sunday, the 24th, for PORCHFEST and drum from 3-4:00. There are bands scheduled before and after us so try and arrive early and bring a chair or two if you can. We have been communicating with the organizers of the 1st Ithaca Reggae Fest @ Stewart Park and we will be hosting a drum circle in the park adjacent to the festival. There's no ticket required unless you enter the actual concert area. They've scheduled us from 2-4:00 but we're thinking if the circle is going strong we can continue on. Parking is in the school parking lots but we can drop off drums and then go park. Try and arrive early to allow for parking and bring extra drums if you can to share with the festival goers that will join in on our drumming. Some of us have been missing our circles at the local festivals and this is a sweet opportunity for One Heart Community Drumming be included in one. Much appreciation to the organizers of Reggae Fest. It's time for that oh so wonderful celebration of this eclectic space in the universe we call home and we will indeed be #2 in the parade once again this year, behind the mayor and in front of the stilt walkers. This is a great spot for many reasons, one of them being that we can march in the parade and still have the opportunity to watch the remainder once we reach the end. Plus um, WE'RE NUMBER TWO!!! out of 112 groups. The parade organizer tells us he likes having us up front as "It sets the tone that this is time for a raucous street party!" If you don't want to carry a drum, bring shakers, tambourines etc or nothing at all and walk, dance, hoop or anything your lil' heart desires. If you want to 'dress up' do it- if you don't want to- don't. For those of you that don't want to walk the whole route you can step in anywhere along the way. It goes from Lewis St to Court St but the sooner you join the revelry the better. Right before Thompson/Bell Park is approximately half way. The parade starts after the Festival Mile runners go through which is about 6:30 so be there by 6-6:15 or so. Our staging spot is at the corner of Lewis & Cayuga Streets. -The Tabernacle Baptists will again open their bathroom facilities for all, and will serve FREE hotdogs, lemonade and cookies. Please enjoy the food and thank them for this generosity. - Beginning at 5:40 pm there will be Festival Mile runners on Cayuga Street, starting at the high school and ending at Court Street. We must keep the north-bound lane of Cayuga Street clear for them. The last set of runners will include several hundred adults and kids. -The Parade turns left onto Court Street and ends after 1 block, beside Sears St. and before the County Courthouse. Please stop all music at this location, as there are religious services in progress ahead on Court Street. Also, if you need to stop to let people off your vehicles, either pull over to the curb or better yet turn left onto Tioga Street so that the groups behind you can keep moving. We'll also discuss the upcoming Ithaca Festival Parade happening on Friday, June 2nd. We've been told we will once again occupy the very coveted #2 position behind the mayor but are still waiting on official confirmation. We need One Hearters to represent and join us, so spread the word far and wide. Plus this is a good time to let your freak flag fly and dress in that, oh so wonderful, hippie style that we all know and love. More details soon. The baton has been passed and the time has come to drum under our willow @ Stewart Park, Saturday @ 3:00. Then @ 5:00 we've been invited to drum @ The Space @ GreenStar, closing the Earth Day Ithaca & People's Climate March hosted by Sustainable Tompkins. But wait, there's more, Sunday the 30th, Streets Alive is happening and we're planning on having a circle @ Thompson Park aka Bell/Triangle Park @ 3:00. There's a plethora of drumming going on this weekend. Make it to one or two or, better yet, all three. Follow your heart. Many thanks to Sacred Root for becoming our winter sanctuary. Our absence on Saturdays is bittersweet, which makes our Fridays together all the more magical. -aka Bell Park or Triangle Park. Celebrate Mother Earth with us as we feel her beneath our feet and give tribute through rhythm and delight in the camaraderie of earth loving people. Bring chairs or blankets if you have them. If the weather doesn't cooperate for this we'll be at our home away from home, Sacred Root. SATURDAY MARCH 11 TIME CHANGE - WE'LL BE DRUMMING 3-5:00 AT SACRED ROOT. Next week goes back to regular time & it's a Friday/Saturday weekend then too. Join us as we gather to celebrate One Hearts 21st Anniversary with a dinner & drum circle along with some, ever so important, camaraderie on Feb 25th @ 4:00 @ Ellis Hollow Community Center. Due to the popularity at the last gathering, ease of serving and clean up we'll be sharing a meal of the seemingly universal food, pizza. So it's not mandatory to bring a dish-to-pass but snacks or drinks would be much appreciated. It is, however, requested that you do bring your love, energy and memories of the circle and the beautiful people, past and present, that have contributed to the longevity and continuation of this very special entity. Especially our beloved Steve Calkins, without whom One Heart would not exist, as it was him that nurtured it/us for so many years and it is the memory of him that motivates many of us as we endeavor to carry on his legacy. December 23rd starting at 4:00 and going until ??? we will celebrate the "Solstmas" at Ellis Hollow Community Center. Dinner will be served although it's not the usual Yuletide feast. This year we will celebrate the Wheel of the Year, the Circle of Earth, the Spiral of Life, our own drum circle or perhaps it's really that no one has to cook, by dining on the circular wonderment & earthly delight known as pizza. It's asked that drummers, if possible, bring sweets/goodies/drinks of their own choosing to add to the merriment. These celebrations tend to get a wee bit louder than the typical circles so please be aware of that. If anyone has special diet requests, such as gluten free, vegan etc send the info and we'll try to accommodate. We will also be at our home away from home, Sacred Root, this Friday & Saturday, the 16th & 17th, starting @ 4:00. Warm yourselves and revel in the beauty of this special place that has opened their heart and shelter to us. It was discussed and agreed upon that we should continue our 1st, 3rd & 5th Fridays at Sacred Root along with our Saturday circles. They start @ 4:00. There are many opportunities this winter to keep us close to each other, so enjoy. Please express our gratitude to Sacred Root in any possible way that you can. We'll have a dish-to-pass meal followed by drumming, This year we're going to change it up a bit and break from the traditional menu and instead have "finger foods" such as appetizers and the like. There will, of course, be desserts too. It's appreciated if you bring a dish but not mandatory. GreenStar and Wegmans have, once again, given us donations to assist in our celebration so many thanks to th...em. Ellis Hollow Community Center-111 Genung Rd., has also donated the use of their building to us and, they too, have our thanks. We'll be there this Saturday only and return to Sacred Root, the following Saturday. Sacred Root has become very special to us and there are no words for our gratitude and appreciation to them for their contribution to One Heart and the Ithaca community. Much love & many thanks. There have been some questions about the circles on the 1st/3rd/5th Fridays at Sacred Root so we'll discuss it this Saturday and get some input from everyone. Winter certainly made an entrance this year. Hope that everyone has acclimated without issue. Stay safe and try and join us for this special circle as we sit back, take a breath and realize that even during these changing times we still do have many things to be thankful for, especially each other. We have found a new location for our winter circles and it is a beautiful one. Many thanks to Sacred Root Kava Lounge & Tea Bar for offering their haven to us. We will be there on Saturdays 4-6:00 starting Nov 12th. Please note, that we will be there Nov 4th for the First Friday Gallery Night @ 4:00. Thanks to everyone that gave suggestions and input on the winter location. Sacred Root is centrally located and should work out well for everyone. If you haven't been there you should try and experience this special place. We'll be at Sacred Root @ 4:00 today, Friday the 21st, and we very much appreciate this beautiful space for our circles, especially now. It's going to be rainy & in the 40's Saturday so we're going to be at the park instead on SUNDAY @ 2;00. We're trying to resolve the issue of not having FOL as our winter home this season and will let everyone know as soon as possible. Melissa, of Foundation of Light, has informed us that we will no longer be able to hold our winter circles there due to scheduling conflicts, as they have something booked for every night of the week and are also full all day long on both Saturday & Sunday. We appreciate the time we have spent there, but we must now look for another winter home. Apologies for the late notice but it has just come to our attention. If anyone knows of a place that we could use for 2-3 hours a week, preferably a Saturday or Sunday, please let us know. Thankfully, we do still have Sacred Root on the 1st, 3rd & 5th Fridays @ 4:00 The one coming up on the 21st will most likely be the only one this weekend since the forecast is a cold, wet one. To all of our friends that can't make the weekday circles, we'll miss you but fear not, we will find a space sooner or later. Remember that our Facebook page has the most up to date information. This Saturday we will return to our normal time of 4:00 at Stewart Park. Perhaps we should transition from wintering at FOL to summers at Stewart Park by starting at 3:00 until Memorial Day Weekend and then go to starting at 4:00. We have a year to ponder this. If it's raining Saturday or if our usual spot is taken due to the Memorial Day Weekend park goers, we might be on the balcony of the boathouse. We did this last Saturday because... of the rain and a good time was had by all. It really was amazing up there looking out over the park. Also, there's chance we'll be in the "little circle" on the east side. Sorry if the time change and location possibilities are confusing but we have to adapt to the situations that might arise. The first, third and fifth Fridays of the month we're at SACRED ROOT KAVA on the corner of State & Geneva starting at 4:00. This is a sweet, mellow, magical place for us to gather and if you haven't been you should make it a point to check it out. The ITHACA FESTIVAL PARADE is Friday June 3rd and we are, once again, 2nd in line behind our mayor. This is great for many reasons, one of them being that we can be in the parade and then become a spectator for the remainder of it after we reach the end. We also are such a beautiful group of people that we have made it onto the front page of the Journal as well as publications such as "Life in the Finger Lakes" & the "Downtown Ithaca Summer Guide". We look like a happy bunch of drummers indeed. The parade starts at 6:30 so try and be there by 6:15, sooner if possible. Traffic will be blocked by then so take that into consideration when trying to reach us at the corner of Lewis & Cayuga- we're spot #2. If you don't want to walk the whole route you can wait for us down Cayuga and join in as we drum by. We're also encouraging members to dress up a bit, or a lot or not at all. Interpret "dress up" anyway your heart desires. The parade is a fantastic, walking celebration of life in this extraordinary place where we share our lives with many fascinating beings. Please come and represent One Heart Community Drumming's part in it. We want you, we need you & we love you. Saturday the 4th @ 4:00, we'll have a circle at Thompson Park on Cayuga while Ithaca Festival is going on instead of being at Stewart Park that Saturday. We're not officially on the docket for the festival as we were in past years but we'll still do our own thing to be a part of it. SACRED ROOT DRUM CIRCLES NOW ON FRIDAYS!!! We will now have drum circles on the 1st, 3rd & 5th Fridays of the month from 4-6:00 at Sacred Root Kava, 139 W State St. This will replace the Saturday circles we are currently doing there. Sundays at Foundation of Light, 391 Turkey Hill Rd. from 2-4:00 will remain the same. One Heart Community please take note of this from Ms. Olivia- Apologies for the late posting. On December 29, 2015, The Rainbow Healing Center of America and Project Rise will be hosting A Celestial Kwanzaa Celebration, at New Roots Charter School, 4:30 PM TO 7:00 PM. I AM requesting the presence of One Heart Drummers to close the Kwanzaa Ceremony with Drumming and African Dancing (if they choose) at 6:OO pm to 7:00 pm in collaboration with the Rainbow Healing Drummers and Dancers and other MASTER Drummers as yourselves and community drummers., Tuesday, 29th we will be Celebrating principle #4 Cooperative Economics called Ujamaa - Our purpose is to collectively invite community to share our one heart vision for our youth, community and globally, for 2016, to connect with all hearts and minds on a global scale in order to change the economic structure of the "have's vs. the have's not"., we will send out our internal visions (now and while drumming,to shift), to the Universal Call for All to Have. Not just the 1%. Therefore, the drummers who will attend can you ask them to make this a #1 focus and purpose. You May also send this out, if rides are needed, please contact me asap. Thank you for your grace and blessing. OUR DRUM CIRCLES ARE AT FOUNDATION OF LIGHT EVERY SUNDAY AT 2:00, 391 TURKEY HILL RD. AND THE 2ND AND 4TH SATURDAYS AT 4:00- SACRED ROOT KAVA, 103 S GENEVA ST. -- inside the Cornell Daily Sun Building. THANKSGIVING DINNER HAS BEEN CHANGED TO 4:00 instead of 2:00 this Sunday due to a scheduling conflict at FOL. Drumming will still follow the meal. 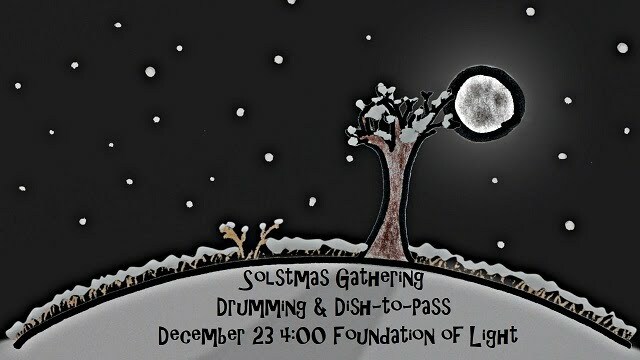 Sorry for the late notice, but drumming as the day turns to night is a special time for us to gather together anyway. Saturday, the 21st, we will have a circle at Sacred Root Kava Bar starting at 2:00. Sacred Root is a mystical gem of gathering space tucked away in the Cornell Sun building at 139 W. State St., with an entrance on Geneva St. It is very welcoming to artist of all types and we're honored to be invited to drum there so please spread the word to our fellow drummers. Sunday, the 22nd, we will be in the "School House" on the FOL premises. There's another drumming event with Nana Anim at the main building so One Heart will be using the school house. It's got an energy that's pretty sweet and we have had some powerful rhythms there in the past. starts at 2:00. Sunday the 29th, we will have our Thanksgiving Celebration including nourishment for the body and soul. There will be food and drumming. More details later. Just a reminder that next February 22nd will be One Heart Community Drumming's 20th Anniversary! Please start making plans to attend this very special event, which will be held on the 21st, as we come together to celebrate two decades of a vision of some very special people including, Steve Calkins, of a place where people of all abilities could gather as a community and find their rhythm. Well done indeed. The weather has grown colder and the transition to locate to our winter home is upon us. This SUNDAY @ 2:00-4:00 we will gather at the Red School House at the Foundation of Light, 391 Turkey Hill Rd. We will on occasion gather at the school house and others at the main building. For those of you that don't know, the school house is the first drive on the right after the turn onto Turkey Hill off of Ellis Hollow Rd. Parking is limited but we can... use the parking lot at the main building. Please do not park on the street. There is to be absolutely NO SMOKING on FOL's premises. This includes in your car. No one is to smell of "smoke" upon entering the premises. This is a stipulation we must agree to in order to use this beautiful space, so please be respectful of it. Also, a small donation is asked from each member if they can contribute. If not, this is not a reason to not join us, for all are welcome at our circle. Join us as we drum our way through another beautiful winter as we head into the end of our 20th year and begin our 21st in February. We will be at FOL every Sunday until spring and we can go back to our summer location at Stewart Park. Our start time is 2:00 pm, sometimes we will be at the red schoolhouse if there is an event scheduled at the main building. Parking is limited at the schoolhouse so if we are there you can park at the main building and walk to the schoolhouse. Check our Facebook page for weekly updates and last minute posts. The following email was sent to us by Cami. I miss Steve living on the hill here with us. Matt and I wonder if any of the drummers of One Heart would be willing to come and bless us with drumming on the evening of Saturday, August 15th. Please extend this invitation. The land is more beautiful than ever and Matt will be making food. We will also have some solar stage music- and open mike. We know there is a lot going on in the Summer- but please consider joining us. Breakfast and coffee will be available in the morning if anyone wants to camp out. . Welcome Home to our anniversary party---balloons and arrows will mark the road from the right turn onto Van Buskirk Gulf Road off of 34-96, halfway to Spencer from Ithaca. For those that don't know, One Heart has attended Matt and Cami's anniversary celebration for many years. They were neighbors with our Steve and have a very beautiful and very private location where we can enjoy a sense of freedom and community. Since Steve's birthday has recently passed, August 4th, for those of us that knew him it can be a way to feel closer to him up on his hill. We will still have our regular Saturday circle at Stewart Park at 3:00 with plenty of time to attend Matt & Cami's event. We have an amazing opportunity coming up. Apparently we made such an impression with our Earth Day circle at GreenStar, that we have been asked to play at the Congo Square Market June 19th at 5pm with the Rainbow Healing Center Drummers at the South Side Community Center. There will be African American Master Drummer Maurice Haltom and His Son Jkhakeem who will play before us and probably join us. Also, there will be a honorarium for the One Heart Community Drummers and The Rainbow Healing Center participants. They hope the donation will help One Heart in the winter to pay for space at the Foundation of Light, or wherever we see the need. Please try to attend what's sure to be a great time as our circle continues to be a part of this unique community and to also show our appreciation to Ms. Olivia for her invitation to be included in this celebration. Plus we'll be having our Saturday circle on the 13th in the SW corner of Stewart Park @ 3:00 . Check FaceBook if you can for up to date information. The parade line-up locations have been assigned and we have the coveted #2 spot directly behind Mayor Svante Myrick!!! This location is fantastic for many reasons, one being that it allows us to not only to participate in the parade, but the opportunity to view it as well, since we will finish before the others. Fellow One Hearters, please make an effort to join us for the parade. Last year there were only eight of us representing our group. Although we were small, our energies were high and we were indeed a beautiful sight. This did not go unnoticed as our picture not only made the FRONT page of the Ithaca Journal, but also the Downtown Ithaca Summer Guide's, Ithaca Festival listing. So this year let's make a larger impact on our community while we show them how strong and beautiful our own One Heart Community is. If you haven't been a part of the parade in the past you owe it to yourself to experience this incredible event. You won't be disappointed as we create an Ithacan memory, while traveling through time and space together as one. After all, isn't it about enjoying the journey ? The parade starts at 6:30 so please be there at least by 6:00 so we can organize. We will be on the corner of Cayuga & Lewis Streets-no vehicles allowed. We will be at our SW corner location in Stewart Park this Saturday at 3:00 - weather looks great and feelings are high !!! ----Keep on keeping on One Heart and as our dear Steve would say "Smile"
We will be drumming Saturday, at the SW corner of Stewart Park starting at 3:00. There was a little confusion last week and some thought we were still at FOL, so spread the word that we are at our summer home. If it rains we will head for cover under a pavilion but, the afternoon is suppose to clear off. The Ithaca Festival parade is in 13 days on May 28th!!! Make plans to join us as we come together and become a part of this "words can not describe" event. Bring yourself- bring your friends. More details to come soon. The time has arrived for us to have our circles on the lake at the park. Hmmm- did you just hear rejoicing across the land? Beginning this Saturday, May 9th, we will once again send our rhythms over the lake and throughout the area, as our energies will have no boundaries. For many of us this marks the official start of the "warm season" and this year especially, it has been anticipated with open hearts. Our gratitude to Foundation of Light can not be expressed enough for being our safe haven during this past, oh so very cold winter. The beautiful space they provide us makes it possible for us to continue our community throughout the year. Many heartfelt thanks to them. Please note that the circles have switched back to Saturdays and are no longer on Sundays. Stewart Park -southwest corner - near the boathouse. Make a left upon entering the park and drive around the circle to "our" corner. Come join our drum circle during Ithaca's "Streets Alive". This is a fun event as we get to mingle with the rest of our community. After the forever winter we just made it through, everyone will surely be ready for some drumming with the sky above our heads and the earth below our feet. You can bring chairs or blankets to sit on even though there are a few picnic tables at the park, there's a low probability we will get any due to the large number of our fellow Ithacans that will be out 'n' about..we've done this before without any chairs, so no worries if you don't bring any. We will be at Thompson/Bell Park on Cayuga St. near Gimme Coffee. EARTH DAY CELEBRATION SUNDAY APRIL 19th @ Greenstar's "THE SPACE"
This Sunday we will be a part of an incredible Earth Day celebration. We are fortunate to have this opportunity to begin to drum at public events once again. This Earth Day celebration, Streets Alive and the Ithaca Festival Parade are all coming up for us. Please make an effort to bring your energies to these events and show our community the love we have for our circle and each other. We aren't scheduled until 5:00 but please come sooner as we may have an opportunity to begin before that- but please be there by 4:30 so we can prepare. Plus, there's many very special festivities going on that you should check out. "In honor of the 45th anniversary of Earth Day, Sustainable Tompkins will again host the Earth Day Ithaca celebration on Sunday, April 19, from noon to 8 p.m., bringing the community together for a day of education, celebration and eco-activism. This year the event is co-sponsored by a Tompkins County Community Celebrations Grant and GreenStar Natural Foods Market, and will be held at The Space (at GreenStar,) one of the greenest structures in town, featuring local inspirational speakers, musicians, poets and earth-friendly exhibitors. The program has been expanded to include the Earth Jam/Poetry Slam, with the voices of today’s poets, rappers and small music acts to perform 10-minute sets." "At 5 p.m., One Heart Drum Circle, an open drum circle based in Ithaca, will present a healing performance. Local drummers are welcome to bring their own drums, shakers, or bells and join in. At 6 p.m., cheer on local performers as the Earth Jam/Poetry Slam begins. MC Errth Boy will usher in musicians, poets, singers, and rappers who will give voice to their feelings about the Earth and the issues surrounding its care." A special thank you to Joey Gates for all the work she has given to this event and for our inclusion in it. We will be celebrating One Heart's 20th Anniversary with a dish-to-pass meal followed by drumming. It's not mandatory to bring a dish but it is much appreciated. It is, however, requested that you do bring your love, energy and memories of the circle and the beautiful people, past and present, that have contributed to the longevity and continuation of this very special entity. Especially our beloved Steve, without whom One Heart would not exist, as it was him that nurtured it/us for so many years and it is the memory of him that motivates many of us, as we strive to try and carry on his legacy. Twenty years ago, (Feb 22nd. 1996), we began the first official drum circle under the name of "One-Heart Community Drumming". (We did drum in the late summer of 1995, [as a unofficial group, ending when the weather got too cold], then formed officially in January of 1996, and began drumming indoors at the school on February [22nd] of 1996.) In celebration of 20 years of weekly drum circles, please join us for our birthday celebration." (from Steve's notes with the anniversary year changed to reflect our current year). The three words that One Hearters long to here.... Stewart Park today. We'll be there at 2:00, hopefully in our regular spot in the SW corner near the boathouse. If it's too chilly there, then check on the east side near the playground- just look n listen. It is also time to bid farewell to our winter home, Foundation of Light. Much appreciation to them for the opportunity to use their sanctuary during our long, cold winters. We will celebrating One Heart's 19th Anniversary with a dish-to-pass meal on Feb 22, beginning at 2:00 followed by drumming until 4:30. It's not mandatory to bring a dish but it is much appreciated. It is, however, requested that you do bring your love, energy and memories of the circle and the beautiful people, past and present, that have contributed to the longevity and continuation of this very special entity. Especially our beloved Steve, without whom One Heart would not exist, as it was him that nurtured it/us for so many years and it is the memory of him that motivates us as we strive to try and carry on his legacy. Please join us and celebrate as we continue our journey into our 20th year. Today is our last circle of 2014, let's drum out the past year and get ready to welcome the New Year next Sunday. Hope everyone had a wonderful holiday. Remember we start at 3, gathering is at 391 Turkey Hill Rd. Looking forward to an eventful last circle this year. This year our Thanksgiving Dinner will be held on Sunday the 30th, before the drum circle, instead of the traditional Thursday. You don't even have to call it Thanksgiving if you don't want to. Perhaps a "Celebration of Community" would be more fitting for some of us. It begins at 2:00 with a dish to pass meal, followed by drumming. A dish is appreciated but certainly not mandatory. So to all of our One Heart family, please join us as we share a meal and then a circle with some very beautiful people. Thank you to GreenStar & Wegmans for their donations, as well as to everyone that contributes their time and love to us. This week (Sunday Oct. 12) we move the circle to the Foundation of Light, 391 Turkey Hill Rd. at 3pm for the winter. No circle this Saturday at Stewart Park. We have had a good summer at the park, we were only rained out 2 times all summer. Looking forward to an eventful winter of indoor circles at FOL. Hope to see everyone Sunday, happy drumming to all. The solstice has passed and fall is here and it's going to be a great day. We will be drumming at Stewart Park at 4 today in our usual spot in the NW corner. In 2 weeks we will be moving to the Foundation of Light at 3pm on Sundays. Thanks to the Foundation of Light to have such a beautiful space for our winter drumming. Today is going to be one of the few warm Saturdays we have left this season so please come join us for drumming on the lake and afterwards head on over to Sacred Root Kava Lounge & Tea Bar for the wonderful happenings there, which go until 10:00 (see the post below). It won't be much longer and we will begin to have our circles at the Foundation of Light on Sundays, beginning Oct. 12th 3-5pm. We are forever grateful to have this beautiful location to shelter us from the cold while we continue to drum through the winter. The verdict is in and unfortunately the circle is CANCELLED today. The temp is only suppose to be 59 at 4:00 and with the wind coming off of the lake it will definitely be a cold one, not to mention the rain. So One Hearters stay warm and dry and keep the rhythms going and we'll see each other next week.